← How to remove image part from PDF file? 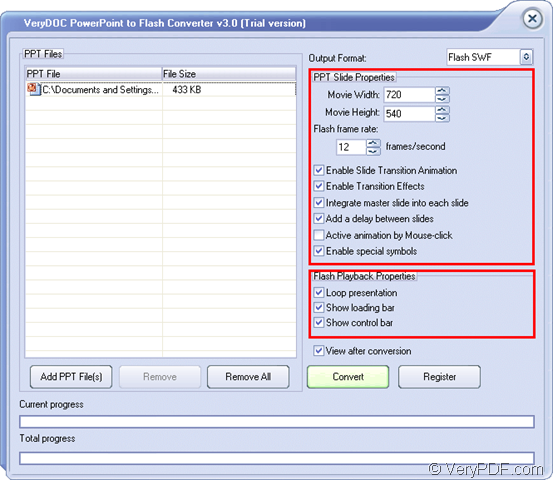 The application VeryPDF PowerPoint to Flash Converter allows you to convert PPT to flash SWF format file with easy operations. This application can exactly represent the original PowerPoint presentation in a created Flash movie. It can retain the animation and audio effects of an original PowerPoint document. This article aims at showing you how to use this application and you just do as following shown steps one by one. Before the conversion, please free download VeryPDF PowerPoint to Flash Converter and install it on the computer at first. Then please open the application by double clicking its icon or open it from Start menu. You can also use your own way to launch the application. The first thing you need to do in the conversion is to load input PPT document. This application supports drag and drop operations for inputting PPT file. Or you can also click Add PPT File (s) button to open file picker window in which you can choose the PPT document. In order to remove the added document, you can click Remove or Remove All button. In PPT Slide Properties group box, you can set parameters for created flash file. For example, the flash movie width and height can be set to the value that you need. The flash frame can also be set to control the displaying speed. 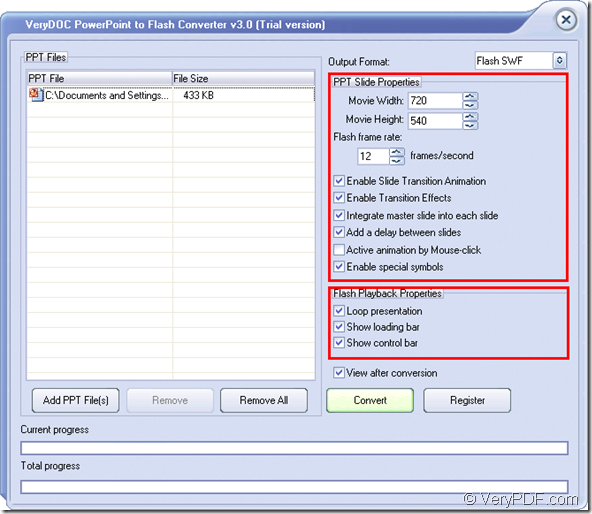 In addition, you can enable or disable the animation effects when converting PPT presentation to flash movie. Please see it in the next snapshot. In Flash Playback Properties group box, you can choose options for created flash SWF file. For example, you can show or hide loading bar, control bar, etc. After setting all the parameters, please click Convert button to run the conversion. There will be a popup Save as window in which you can choose the output location for created flash file and then edit the name for the file. Click Save button, the conversion will run itself and you need to wait for several seconds until the conversion is accomplished. If you want to have a try of VeryPDF PowerPoint to Flash Converter now, please click the following button to download the free trial version. If you want to know more information about the application, welcome visit the homepage of VeryPDF PowerPoint to Flash Converter. This entry was posted in PowerPoint to Flash and tagged PPT to flash. Bookmark the permalink.